Leaders of San Diego’s Islamic community on Friday condemned Wednesday’s mass shooting in San Bernardino while calling on the public to not lump all Muslims with those who commit criminal acts. The FBI said the shootings at the Inland Regional Center by husband-and-wife Syed Rizwan Farook and Tashfeen Malik were being investigated as terrorism. Malik posted a pledge of allegiance to Islamic State leader Abu Bakr al-Baghdadi on Facebook, authorities said. At a news conference, Hanif Mohebi, director of the San Diego chapter of the Council on American Islamic Relations, said numerous threats have been made against Muslims and people in their office this year. The situation has been made more difficult by the shootings. “It is unfair — it is a double-standard — for anyone to come out and say, well, you know, this person was a Muslim and therefore it’s terrorism and so on and so forth, when the Planned Parenthood situation arises and no one goes to the religious community and says, hey, what do you say?” Mohebi said at the news conference. He referred to a shooting last month in Colorado Springs that killed three, including a police officer. 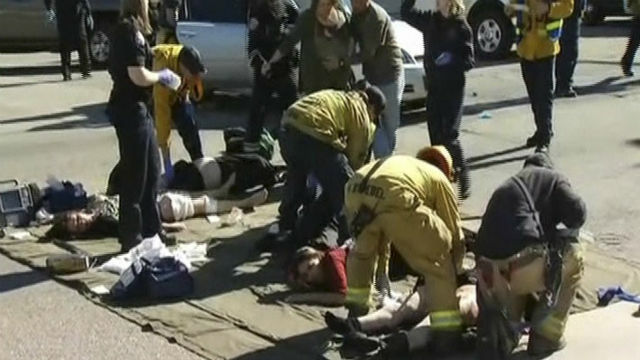 The San Bernardino shootings killed 14 people and wounded 21 at a meeting of public health officials that doubled as a holiday party. A dozen victims were county of San Bernardino employees. Farook and Malik died inside a vehicle hours later during a shootout with police. Law enforcement officials said ISIS, which has called for followers to strike inside the U.S., may have inspired the shootings, though none said the group ordered the attack. After the shootings, investigators found numerous weapons, ammunition and explosives at the scene, the shooters’ residence and their vehicle. NBC San Diego reported that among them were a rifle and handgun purchased at a Turner’s Outdoorsman location in San Diego, but no other details were available. On Facebook, CAIR San Diego urged area Muslims to remain vigilant, take threats seriously, and contact law enforcement in a timely manner.